Paper dresses with iconic images have made Sarah Caplan a fashion poster child. Working from her Manhattan design studio, a pregnant Sarah Caplan '88 proves that her innovative paper wardrobe doubles just fine as maternity wear. 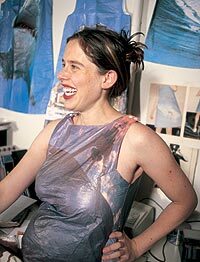 An Oberlin art major-turned-clothing designer, Caplan has created a respected niche in the fashion world with her wearable, bold, postmodern dresses that speak volumes about our society. Her clothing line, which evolved from poster dresses to jackets, vests, and skirts, has attracted reviews in dozens of media outlets. Even the esteemed Fashion Institute of Technology houses her works in its museum's permanent collection--not bad for an artist with little professional fashion experience. "I remember photocopying a 1960s picture of a woman wearing a paper dress with an image of Bob Dylan on the front, which I had found in a book in the art museum library at Oberlin," Caplan says. "Thirteen years later I still have the print and keep it on my wall for inspiration." Caplan put a millennial spin on the concept first introduced by Scott Paper Company in 1966 to promote colored toilet paper and paper towels. Half a million op-art and psychedelic-patterned paper dresses sold for $1.25 apiece, igniting a fad that even the Duchess of Windsor embraced. A paper-thin concept? Hardly. The disposable dresses of the '60s were part of a much broader social movement. As we evolved into a use-and-toss society, consumers became accustomed to throwaway cutlery, diapers, and containers. Why not throwaway fashion? While strolling through New York City eight years ago, Caplan stumbled upon a street vendor selling one of these vintage paper poster dresses for a mere $2. "They were worth up to $1,000 at the time based on a Sotheby's auction," she exclaims. "And that was before eBay!" She wore her acquisition to a museum opening and was photographed by fashion trendwatcher Bill Cunningham for The New York Times style section. "The dress had a huge image of a woman's eye," she says. "I just couldn't believe the response it got." The experience inspired her to reinvent the design classic for the millennial set. She ditched the original disposable paper for Tyvek, a biodegradable, water-resistant, high-density polyethylene manufactured by DuPont that is surprisingly durable (ever try to rip a FedEx envelope?) and machine washable. The fabric gets softer and more wrinkled with each wear and wash, but it lasts. Perfect for a population that has replaced the word disposable with recyclable. She kept the original design, an A-line cut, which is deliberately simple and offers a wide canvas for the attention-grabbing pictures, but flowers and psychedelia were replaced with powerful images reflective of a bigger, faster mentality: a satellite dish, an opened-mouth shark, the World Trade towers, a lightning storm, and a surfer cresting a massive wave. "It's all about speed now," Caplan says. "Things are spinning out of control with technology and communications. Time is out of balance." To suit, she named her company MPH (Miles Per Hour), emphasizing that her designs are abstract art items first, articles of clothing second. "This project was more of an artistic endeavor than pure fashion design," she says. "While fashion wasn't my number one priority in college, I always felt it had an undeniable seductive power and could be used just as any medium can to express artistic notions. Oberlin had a great art department and really encouraged me to question, think critically, delve, push the boundaries. "I wanted these dresses to be conceptual; something with an idea behind them," she adds. "Not something that changed with the whims of fashion." An issue of Financial Times last year credited Caplan with being well ahead of the trend, citing a recent Paris exhibition, Papiers a la Mode, which displayed intricate dresses made entirely of paper. Caplan's creations sell at retail stores in New York and through her website (www.mph-nyc.com). For her next designs she has several ideas, working with advertising images among them. "I find advertising annoying, as it's so ubiquitous. Even New York City has buckled and now allows billboards to invade what was a pristine urban landscape." Ads, she says, have been boiled down to stark, recognizable imagery ("think Marlboro Man or the Nike swoosh") that need no words or explanation. "Advertising has replaced art in its power to sway, manipulate, and seduce us. In many cases, the ads are confusing, yet the public has an instant, visceral response and wants to buy into the fantasy. "For me, using these images on my dresses would be a commentary on what powers are at play in our lives, what guides us in our consumer-based culture." Lauren Parker is the executive editor of Smock, a glossy publication that fuses contemporary art with fashion, style, and design.